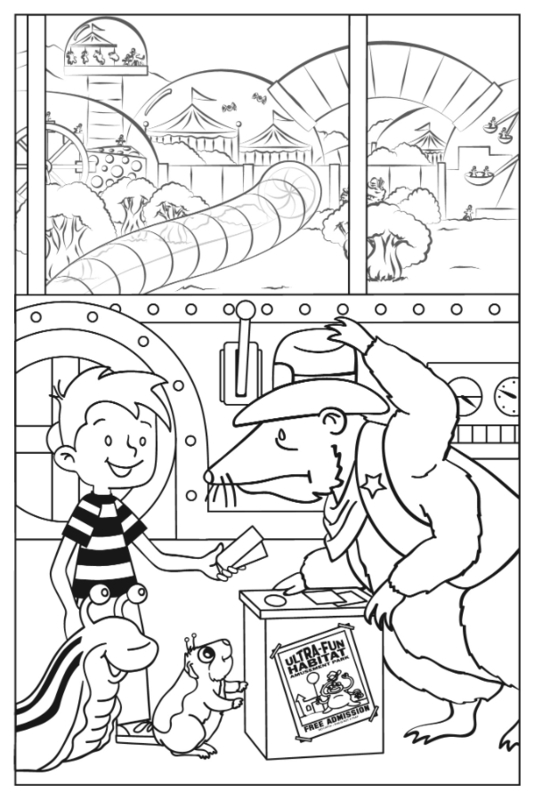 The Ultra Fun Habitat is the most exciting amusement park in the galaxy. 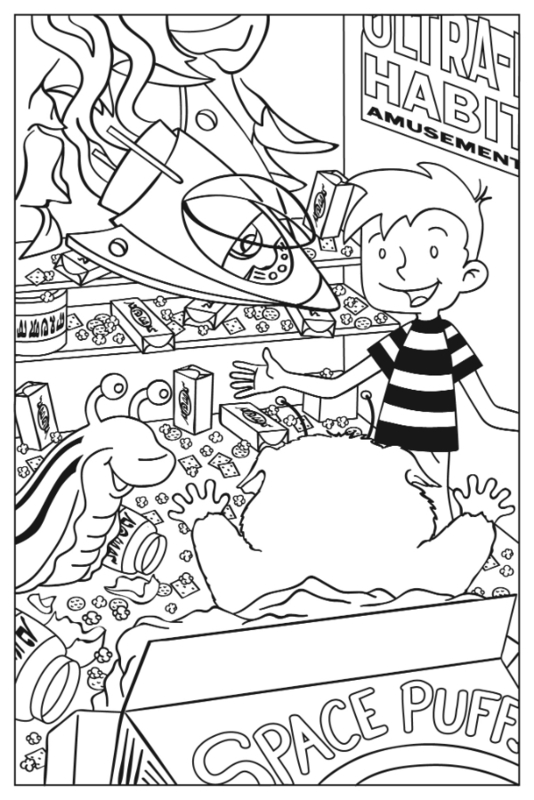 It has rides, it has games, it has every kind of junk food and souvenir imaginable. It even has free tickets! What could go wrong? Tommy and his alien friends discover that it’s easy to get into the Ultra Fun Habitat, but getting out will be their biggest challenge yet! 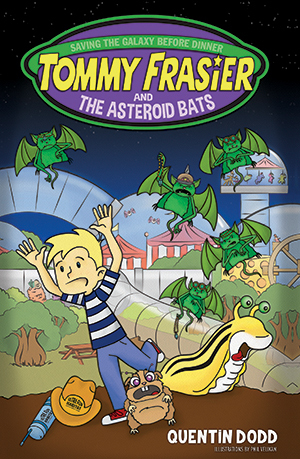 Read the first few chapters from Tommy Frasier and the Asteroid Bats! It started out as a pretty normal day. I ate breakfast. I said goodbye to my mom and dad. I asked my little sister Bonnie not to mess with my stuff, and I walked to school. We were halfway through spelling, which is the first thing we do every day, when the intercom beeped. On my way to the office, I tried to imagine why they wanted to see me. I didn’t think it could be anything good. The last time this happened, my mom had come to take me to the dentist. The time before that, it had been because my dad’s keys had somehow gotten into my backpack. I wasn’t looking forward to finding out what was going on this time. When I got to the office, Mrs. Hogblossom, the office lady, smiled at me. She’s a nice lady. She smiles at everybody, even the kids who are in trouble. “Your dad’s here to pick you up, Tommy,” she said. Mrs. Hogblossom pointed to the corner of the office. At first, I didn’t know what she was pointing at. All I saw was a tree in a wooden tub. Then I saw a pair of green eyes on long stalks peeking out through the leaves. When they saw me, they blinked happily and the leaves rustled. Something slid down the trunk and landed on the carpet. It was slimy and yellow, with black stripes running along its back. It was a giant slug. It was a giant slug that I knew. His name was Vern. Earlier, Vern and I had been on an adventure in outer space together. I had hoped that I would see him again. But I never expected to see him in the office of my school. I looked from Vern to Mrs. Hogblossom and back. Neither of them acted like anything was unusual. Vern had a little sign around his neck that read, “I am a normal human being.” It didn’t fool me, but it seemed to fool Mrs. Hogblossom. Before I could say anything, Mrs. Hogblossom pointed to the sign-out book on the desk. “Don’t forget to sign out,” she said to Vern. “Oh, right. Don’t want to forget that,” Vern said. Vern slithered up to the top of the desk. His eyestalks bobbed as he studied the sign-out book. Finally, he picked up a marker with his mouth and coated the tip of his tail with ink. Then he slapped it onto the page, making a smeary tail-print. I stared. I couldn’t believe what was happening. Outside, the sun was shining, the birds were chirping, and no one cared that I was walking around with a huge talking slug from another planet. “Why did Mrs. Hogblossom think you were my dad?” I asked. I wasn’t sure I believed this. Maybe he was right. I know my mom says pretty much the same thing. Vern pointed to the lot where the teachers parked their cars. A silver spaceship was sitting in between a red van and a little green car at the back of the lot. The spaceship was shaped like a sausage and it stood on three skinny legs. “Do you have time to go on a trip?” Vern asked. I thought about this for a second. I didn’t have any tests today. The cafeteria was serving meatloaf for lunch, which was my least favorite. Besides, I was already signed out for the day. We climbed into Vern’s ship. It was still a tight squeeze for me, so I had to sit in the back. Vern pushed a few buttons and pulled some levers. The ship began to rise. A few minutes later, we were in space. The Earth looked like a desktop globe full of tiny details. Vern swerved the ship to avoid a satellite. “Look under the seat,” Vern said. I squirmed around until I could reach under the front seat. I found two little tickets, each about the size of a dollar. At the bottom was a drawing of a three-eyed alien. It stood in front of a castle. It held a balloon in one tentacle and an ice-cream cone in the other. The alien looked like it was having a good time. There were words printed on the tickets. At first, I couldn’t understand the alien alphabet, but when I looked again, the words made sense. “What’s the Ultra Fun Habitat?” I asked. I checked the tickets. They really said that. “So it’s got to be all right, right?” Vern said. We flew through space while Vern told me about what was going on with his planet. The Space Slugs were friends with the Arctic Viking Ducks again. King Gordon, the leader of the Space Slugs, had visited the ducks’ planet and rode on a float in one of their parades. King Gordon had been showing off the pictures from his trip for weeks. I told him about what had been happening at my house. I told him that I was thinking about playing baseball in the spring. Then I told him how my sister Bonnie had been trying to get me to play a new board game called Pink Pony Adventure. She had gotten the game for her birthday. I had been making excuses not to play. I don’t like ponies as much as she does. I don’t think anyone likes ponies as much as she does. We didn’t talk about anything very important, but it was nice to just talk about stuff. It wasn’t long until we reached the planet. Vern started to land. I looked out the window. It was rocky and purple, with tall mountains that stretched off in all directions. As we got closer to the ground, I saw lots of dark blue trees that grew into big round shapes, like giant bushes. Vern flew between the mountains for a while until he found a wide valley. I saw a few dirt roads and a couple of buildings. Vern settled the ship down in a parking lot and shut off the engine. He opened the hatch. I rolled out and he scooted down behind me. The road cut through a forest of blue trees. Here and there, a jagged purple rock stuck out of the ground. The rocks had crystals in them. The crystals glittered in the light from the two suns overhead. There was no one else around. In the distance, I saw a building by the side of the road. “Let’s see if they can give us directions over there,” I said. “Snacks?” I said. I was starting to get a little bit hungry. Vern slithered up to the doors. They opened automatically. He dashed inside. I followed him. There wasn’t much space inside the Snack Shack. There were shelves of food all over the place. I recognized some of the food, like bags of potato chips and boxes of cookies. There were also things I had never seen before, like glass jars of orange leaves, and cages full of yellow fruit with wings. The fruit buzzed back and forth like lazy bees. There were also metal bolts dipped in chocolate and wrapped up in clear plastic. In the back, there was a big refrigerator with glass sides. It held ice cream, cold drinks, and box of popsicles made out of something green and slimy. There was no one else in the store. There wasn’t even anyone behind the counter. That seemed strange. We saw a bunch of broken glass jars on the floor. I could tell from the smell that they had all been pickle jars, but I didn’t see any spilled pickles, or any pickle juice. That seemed strange, too. Then Vern showed me something that seemed even stranger. “Wow! Check this out!” he called from another aisle. I went around to see what he was talking about. A very small spaceship had crashed into the wall of the Snack Shack. It had punched a hole right through the side of the building, scattering crackers and popcorn all over the place. The ship was smaller than the kitchen table at my house. It was hardly any bigger than the deluxe Galactic Adventures Space Cruiser that I was hoping to get for my birthday. “What do you think this is?” I asked Vern. “I think it’s a spaceship,” Vern said. “I mean, do you think it’s real?” I asked. “It’s totally real!” said a voice behind us. We spun around. At first, we couldn’t see who was talking. Then we saw that one of the cereal boxes on the shelf had been torn open. From inside the box, two round eyes blinked at us. There was a rustling sound. A second later, something scrambled out to meet us. It was about the size of a guinea pig, covered with light-colored fur. Two little antennae stuck up from the top of its head and twitched like whiskers. “You guys!” the creature said. We had met Ug on our last adventure. Some of the other Space Slugs had thought Ug was one of the greatest warriors in the galaxy. He is not. He did manage to save the day when we were in trouble, but I don’t think he did it on purpose. Ug did a happy dance and knocked over the box of cereal. Flakes and marshmallows and little green bits scattered all over the aisle. “In my space boat!” Ug said. “I didn’t know you could fly one,” Vern said. He pointed at the little ship stuck in the wall. “Do you want us to get that down for you?” I asked. “You guys are the best!” Ug said. Ug’s ship wasn’t very heavy. I was able to pull it out of the wall and set it in a shopping cart. I wheeled it back to where Vern had parked. As I did this, Ug perched on the nose of his ship. He stood there with his tiny arms open wide. I had to admit it, I had missed Ug. Once we stowed his ship, I returned the cart. When I got back, Vern and Ug were talking. “Ug found one of the free passes at the Intergalactic House of Tacos, too,” Vern told me. “I got a delicious taco and a discount coupon on the very same day! It was my best day ever!” Ug said. “Do you know where the Ultra Fun Habitat is supposed to be?” I asked. Ug scampered down the road. Vern and I had to hurry to keep up. Ug led us around a big hill of purple rocks and glittering crystals. The blue trees made it hard to see everything at once, but I could see a bunch of gigantic plastic domes, each one as big as a football stadium. Inside them, there were booths with different-colored awnings, and all kinds of carnival rides, too. Some of them looked like the rides we had on Earth, but I couldn’t tell what a lot of them were supposed to do. In the biggest dome, the one farthest away from us, we saw a full-sized castle. The domes were all connected by clear plastic tubes. Some of them ran along the ground, but others arched through the air and twisted around in crazy patterns. The whole thing reminded me of the fancy cage that our class hamster lives in at school. Wooden signs pointed to a stone building with a green roof. There were a lot of flower gardens and picnic tables around it. A plastic tube connected the building to the first dome. There were huge letters painted on the steep roof. We climbed the steps to the stone building. As soon as we got inside, Vern and Ug stopped short. “Wow.” Vern’s eyestalks tried to move in every direction at once. Inside the building, it was wall-to-wall souvenirs. There were hats, t-shirts, shiny polished rocks, snow globes, a squashed-penny machine, postcards, and guide books. I saw a big bin full of those pens with the little scenes in the barrel that float back and forth when you tilt them. “This is the greatest!” said Ug. His claws made little skittering sounds on the wooden floor as he ran around. In the middle of the room was a glowing display board that showed a map of the Ultra Fun Habitat. Behind that was the checkout counter and a see-through red plastic door. Through the door, I could see the long tube that led to the first dome. Suddenly, something big popped up from behind the counter. It was gray and fuzzy. It was bigger than a couch. It had a long snout with sharp teeth, round pink ears, and little beady black eyes. It was gigantic, and it had an extra set of arms, but other than that, it looked just like the possum that tried to live in our garage last summer. Bonnie and I had wanted to feed it, but my mom chased it out with a pitchfork. This possum wore a gold cowboy hat with a purple Ultra Fun Habitat logo on it. The name “Larry” was stitched across the front of the hat. In one pink paw, he held a display stand. The stand was loaded with crystal necklaces, the kind my sister likes to buy whenever we go someplace that has a gift shop. The possum set the stand down on the counter and blinked at us. “That’s a great hat,” Vern said. Space Slugs are very interested in hats. Whoever has the best hat is in charge of their whole planet. Larry the possum wobbled back and forth a bit. He seemed dizzy, the way my dad does after he takes my sister on the spin ride at the fair. “We have free passes for the Ultra Fun Habitat,” I said. Larry nodded. He lumbered over to the red plastic door and pulled on a long lever. With a squeak, the door rolled to the side. He bowed low. When he did that, he kept one paw on his hat. “Don’t you need to see our passes?” I asked. Larry shook his head and pointed to the door. Vern, Ug, and I walked down the tube toward the first dome in the Ultra Fun Habitat. The tube was made of plastic and as wide as a hallway. At one point, I might have thought that any kind of giant, four-armed possum was weird, but not anymore. In my adventures with Vern, I had already met Space Slugs, Arctic Viking Ducks, and whatever Ug was, so the possum himself didn’t bother me. But I did think he was acting funny. “You’re right! He was the weirdest!” said Ug. He scampered in big circles around us, like an excited puppy. We passed under a different tube that connected two other domes, then reached the end. A slide led to the floor of the dome, so we slid down and began to look around. The first ride we saw was something that looked like a giant see-saw. After that, there was a big metal wheel. It looked like you could climb inside the wheel and run around to make it spin. There were lots of booths and tents, too. Everything was painted in purple and gold colors. There were life-sized cartoon cutouts of happy aliens laughing and having fun. At the other end of the dome we could see a small hut made of yellow plastic. Next to it, another set of tubes led to other domes. Those tubes had a metal rail running along the inside. As we watched, a train came riding along on the rail and stopped at the little hut. 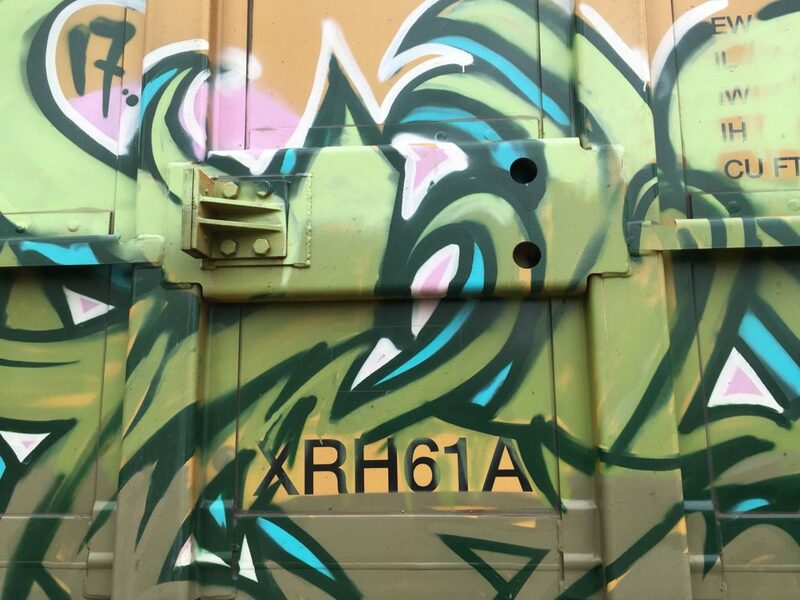 Doors opened up on the side of the train. A couple of possums and a few other aliens stepped out. They all wore the gold Ultra Fun Habitat cowboy hats. “Look at that,” I said. “Look at what?” Vern asked. “Candy!” said Ug. He darted off to explore the cotton-candy booth. I looked up. I could see the two suns shining overhead through the thick plastic of the dome. “Well, that does seem odd,” Vern said. At the cotton-candy booth, there were bags of cotton-candy tied to racks, ready to be sold. But there was no one to sell them. There was nothing but a gold Ultra Fun Habitat hat on the counter. It had “Karen” stitched on the front. Ug had chewed his way through one of the bags and burrowed into the pink, puffy ball of cotton candy. A second later, his head popped back into view. “Ug, stop that,” I said. Still covered in pink cotton candy, Ug leaped onto the counter. The hat rattled. While Ug looked around for more trouble to get into, the hat rattled again. We heard a whirring sound, like a tiny motor. Suddenly, the hat began to move. It flew a few feet into the air, then drifted sideways. A second later, it dropped onto Ug and covered him up. “I’ve disappeared!” said Ug, from underneath the hat. The hat lifted up again. This time, it carried Ug with it. Before Vern and I could do anything, it flew away over our heads. “I have a candy suit and a flying hat! Look at me!” Ug shrieked. The hat, with Ug attached, flew over the booths and the rides and disappeared down another tube. “What the heck was that?” Vern asked. I didn’t answer. Instead, I stared at something over by the giant wheel ride. It was two more Ultra Fun Habitat hats. They were flying slowly through the air. They were heading straight toward us.